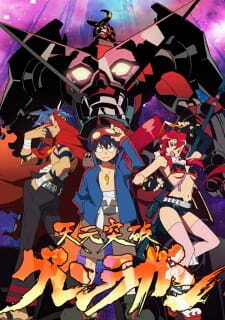 With its interesting storyline and crazy characters, Tengen Toppa Gurren Lagann is one hyped up anime. Aside from the endless spin-offs and alternate versions, the original is always the best. What can I say about this anime. It is a crazy roller coaster ride from start to finish. The story has many plots and twists that will make you surprised with excitement or feelings of frustration. It is take king of story that will make you laugh and cry or both at the same time. The story is a bit much for a 27 episode anime hence the fast-tracked pace of the telling of the story. In the end, all I can say is that, the story arc brings many different emotions to you whether you like it or not. The art was well done as expected for a sci-fi fantasy film. The visual effects were great and the clashes of metal against metal is simply stunning. The portrayal of the characters was somehow a bit over-the-top or slightly inappropriate for the theme of the anime. Could be just me though. The bots look awesome if not strangely humorous to look at. Voice acting was excellent and the sound effects were of high quality and quantity throughout this anime. The theme songs and mid-episode breaks were catchy and I still have that catch phrase stuck in my head. (You will have to watch to find out what I mean). The characters were memorable more or less on how you view them. Of course the girl with the revealing clothing comes to mind first, but the other main protagonists are just as memorable. The individual personalities and accomplishments are embedded to your mid as you watch every episode and discover more and more about the hidden past, new enlightenments and interesting resolutions. Overall, I was hyped-up at how awesome it was at first, but after watching many episodes, that tensioned has died down. Some bits were really interesting, whilst others was downright disappointing. It is really up to you to decide if you are going to like this anime or not. Good plot twists and back stories. Would have loved it if it was so much more simpler and straightforward, but then again, it would ruin the fun. Good use of visual effects and fluid animations. Characters were different to each other. Generally of high quality and appropriateness. The theme songs were catchy to an extent. Some characters you will find annoying, others are just a pain, others you will come to love. Got really hyped up at the start, but then it went downhill and uphill again. Like a roller coaster. Its good, has some nice action scenes and story line. Just the lack of explanations in some bits was a bit disappointing. The plenty of dry jokes gets a bit lame in the end.